Working in a number of educational settings over the years, I have witnessed various initiatives to try reduce what we teachers tend to call 'inappropriate language'. By this we usually mean typical words classed as 'swearing' and from there, this has also included words with racist and sexist connotations. Recently Ofsted have also focused on how schools address language with homophobic connotations, particularly habitually used words such as 'gay' as a way to describe something at fault, to be disapproved of etc. As an SEN / SpLD teacher, one of my bugbears is hearing students casually using words such as 'retard', 'mong' and 'downie'. 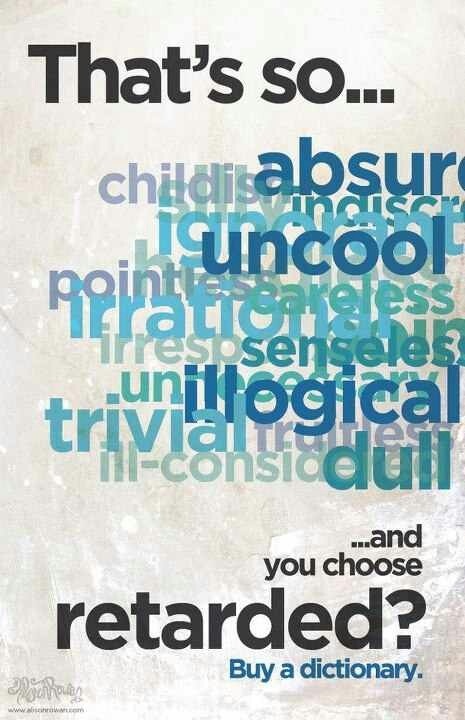 Students use these words for a variety of reasons, often in a jovial way to describe a friend who has made a silly mistake, made a funny slip of the tongue etc. However, they also use it as a 'put down' during more heated banter and outright conflict. When you talk one-to-one with the student using the word, and explain in blunt terms its history and what they are implying by using it, they are without fail remorseful and commit to avoiding it in future. In addition, on occasion I have had conversations with parents over the past ten years who - usually without actually saying these words - have basically said they don't want their child undertaking specialist assessment and/or receiving extra support on the basis they might end up labelled in such a way. Again, there is a need to talk this through and challenge the stereotypes. This trend isn't new and we are perhaps all guilty. I certainly remember in my own childhood words such as 'spaz' and 'flid' being used commonly on the primary school playground, with some children going further to imitate disabled people. Another stand out memory of mine was around the time when The Spastics Society changed their name to Scope and a student attempted to call a classmate 'scopey' as an insult, and then had to explain what it meant when other classmates looked on confused. What also stands out at that point was how the entire secondary classroom, on realising what he was saying, then responded to him with disgust for this 'witty innovation'. So I do think perceptions of disability are gradually changing for the better. I think this is partly due to greater inclusion in schools, with more children with disability attending mainstream schools or attending an SEN school situated alongside a mainstream school. I have worked closely with a colleague at a BSF school set up in this way and she certainly feels the day-to-day presence of children, often with more severe disability, has helped create a much more caring, understanding culture in her school. I also think the London Paralympics last summer went a long way in challenging stereotypes and I have witnessed a notable decline in students using such words since then. 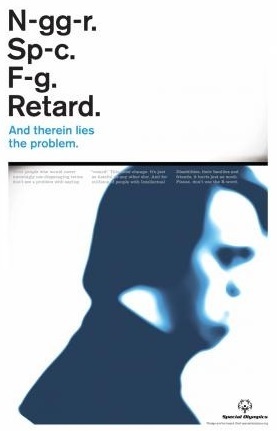 "The R-word is the word 'retard(ed)'. Why does it hurt? The R-word hurts because it is exclusive. It's offensive. It's derogatory. Our campaign asks people to pledge to stop saying the R-word as a starting point toward creating more accepting attitudes and communities for all people. Language affects attitudes and attitudes affect actions. Pledge today to use respectful, people-first language." If we are to change entrenched attitudes and practices, then words are a good starting point.